Florida’s Gulf coast lifestyle is one of the world’s most coveted. Pulsating nightlife, diverse cuisine, and a booming economy; not to mention award-winning beaches that stretch as far as the eye can see. But like all cities facing the Gulf of Mexico, Sarasota has plenty of hidden cultural gems, too. Tucked away in the city’s waterfront enclaves is an architecture that speaks casual elegance, a brand of luxury expressed with a regional sensibility. While most tourists come to flock the city for the beaches and art galleries, a significant number of people come to unravel its treasure trove of mid-century modern buildings. Cocoon House, designed by one of Sarasota School’s pioneering masters Paul Rudolph, is a prime example. Also known as the Healy Guest House, the structure perfectly captures the regional style of post-war architecture that flourished in Florida’s Central West Coast between 1941 and 1966. While the movement ended decades ago, the style’s core tenets continue to inform architects across the globe. Deeply inspired by the sea and that old Florida charm, the Cocoon House, along with the equally iconic Umbrella House, Padgett House, and Rupp-Seibert House in Lido Shores are where modern architecture meets subtropical lifestyle. Clean, straight lines, deep roof overhangs, brise-soleil, sun-shading louvers, and floating geometry. Among other things, these features form the architectural identity of the Sarasota Modern home. Paul Rudolph’s beach houses were inspired by his work as a naval architect during World War II. Upon returning to Sarasota, he set out to make his ideas come to life and reinvent the way people live by the water. Open floorplans, sliding doors, immense glass walls, and plenty of patios and verandahs are key hallmarks of the style. You’ll notice wood louvers, too, which cut the summer sun and provide privacy. Trellis structures line the patios and verandahs for shade, while jalousie glass windows and sliding doors open on all sides to generate a cooling cross-breeze during Florida’s unforgiving summers. Assembled from flat planes of concrete, plywood, and a host of other light materials, Rudolph perfected a style that’s “elegantly restrained and ultra-modern,” as described by Alastair Gordon in the Wall Street Journal. Rudolph and his contemporaries focused on designing for the local climate and regional tastes, while the elaborate Mediterranean and Art Deco styles underwent revitalization in South Beach and all over Florida’s East Coast beaches. Local materials, such as tropical hardwoods and softwoods will warrant a discussion, but the extensive use of glass takes the spotlight here, as it helps forge the connection with nature, particularly the sea and sky. The interior of a Sarasota Modern home is wide open, bright, and restrained, with rooms flowing from one to another. The purpose of this is not to distract the eye from the view, to soften the boundary between indoor and outdoor. The glass holds up the illusion that the home is one with its surroundings, hence the low bungalow style and unassuming façade. If it’s not an ocean view, it’s a landscaped tropical garden, sun-drenched patio, or a towering tree beckoning you to go out and bask in the ocean breeze. The Sarasota School pioneers’ relationship with Frank Llyod Wright, who was then at the forefront of designing structures in harmony with nature, influenced this philosophy. Interestingly, this form of expression matched well with the community’s collective desire to preserve the area’s quaint and quiet charm. The beach houses designed by Paul Rudolph, Ralph Twitchell, William Rupp, Victor Lundy, Jack West, Carl Abbott, and Gene Leedy became immaculate pieces of the puzzle, of the thoughtfully planned city Sarasota locals envisioned it to be. Young, liberated, and enlightened by nature, this band of architects built homes that are intelligent and wonderfully responsive to the region’s vibrant community and sub-tropical environment. Beyond aesthetics, Sarasota Modern also made sense in a functional and economic sense. After the war, resources and money were tight, and waves of soldiers came home, resulting in a huge demand for elegant but inexpensive homes that would allow them to make the most of beachside living. This provided an opportunity for the young architects to start a movement that’s indigenous to the region. The result is these highly innovative homes, now revered by the world over and embraced by a new generation of architects. With threats of climate change and rising sea levels stirring the region, architects are turning to Sarasota School for lessons on building light and smart. The movement is currently experiencing a second wave of appreciation, evidenced by the growing number of Mid-century Modern homes bought and lovingly renovated to suit varying tastes. Shayla Twit, a renowned real estate agent in Sarasota’s stunning keys and barrier islands, note the quaint but luxurious quality of these homes. Twit stresses that these waterfront jewels are where culture, art, and the unique Sarasota way of life come together, offering an experience that’s unlike any other. Over the years, there has been a surge of homebuyers and investors actively seeking Mid-century Modern homes, so that they don’t fall into the wrong hands or risk demolition. In addition to the efforts of making these homes sellable in both the mid-range and luxury end, this unique architectural style is now as celebrated as the city’s world-famous visual and performing arts scene. Seamless flow, thoughtful interiors, expansive patios, and meditative verandahs, all fitted with today’s idea of convenience and surrounded by lush tropical foliage. It continues to make headlines, thanks to an enthusiastic community of art lovers and outdoor enthusiasts who are as proud as the architectural heritage of their dazzling beaches. 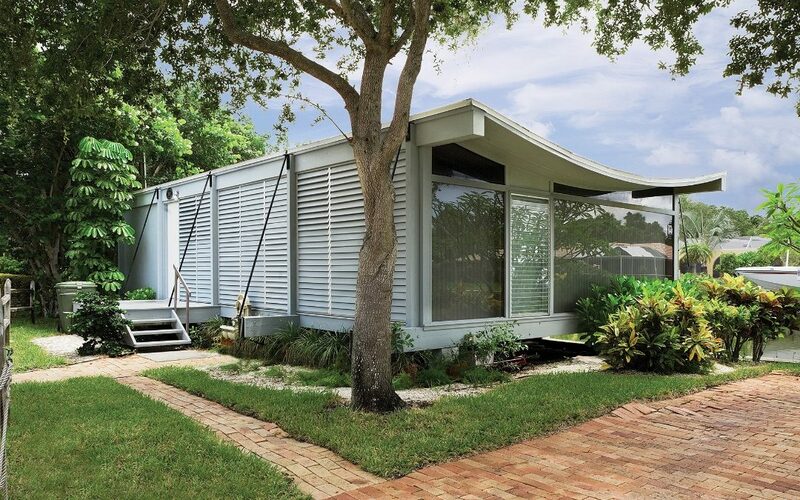 Image “The Healy Guest House / Cocoon House” via SarasotaMOD on Pinterest.